Bridget Jones (Renee Zellweger) is a single thirty-something living in London, desperate to lose weight, stop smoking, reduce her drinking and to find the man of her dreams. But between her friends and family, it seems unlikely that she will make good choices or stick by them. Will she stay with the charming but unreliable Daniel Cleaver (Hugh Grant) or go with the sometimes charming but mostly socially awkward but reliable Mark Darcy (Colin Firth)? Having recently read the book, I felt this was a darned good interpretation. Renee Zellweger was perfect for Bridget Jones; in fact, all of the casting was perfect. 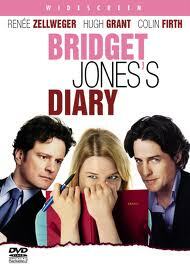 It was a shame to lose Bridget’s love for Colin Firth, though as he was playing Mark Darcy, there was really no way to make this work. Any changes from the book worked well, apart, possibly, from some of the stuff with the three best friends. Personally, I’m quite a fan of all three (Shirley Henderson, Sally Phillips and James Callis) as actors, but found the sycophantic nature of the characters in this flick very annoying. Though I am completely aware that the plot would not have worked had they been much different.